Classical Chinese ink-and-brush paintings embody millennia of tradition as well as the freshness of the human encounter with nature. 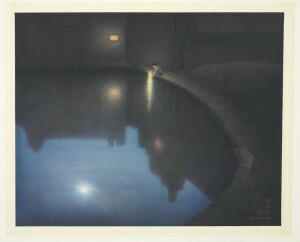 Wu Lan-chiann (born 1972), Precious Light, scroll, mounted for framing, ink and color on paper. Tang Yin (1470–1524), Playing the Zither. 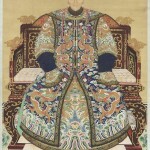 Ancestral Portrait of a Princess, Qing Dynasty, late 18th century, ink and colors on silk. Before his death last August, the American collector, dealer, and scholar Robert Hatfield Ellsworth prepared a historic bequest—that a major part of his collection of Asian artworks would be auctioned, without reserves, through Christie’s in New York. When that series of sales takes place this month, the largest private collection of Asian art ever to appear at auction will come on the block, a total of approximately 2,000 objects. Substantially represented among them will be Chinese paintings from the 15th through 20th centuries, an art form that until recently was much more sought after by Chinese collectors than by Westerners. Through his writings, art dealing, donations to museums, and perhaps most of all his cultivation of a whole generation’s worth of Chinese art experts, Ellsworth did a great deal to make Western collectors aware of the riches of traditional Chinese painting, and to dispel some of their fear that these works are too recondite, too scholarly, perhaps even too refined, for non-Chinese to understand and appreciate. To be clear, when we talk about Chinese painting we mean ink (black or colored) and brush on paper or silk, not oil on canvas. Under Western influence, many Chinese artists took to oils during the 20th century, some to emulate pre-modernist European figural art of the Academic or Impressionist schools, some to engage in Social Realist work for the Communist cause. More recently, Chinese painters have been aggressive entrants into the world of international contemporary art, and famous works such as Yue Minjun’s series of ubiquitous smiling men have been created with Western-style painting techniques. At the same time, however, there is a sizable contingent of painters in China and Taiwan today who create new work in traditional styles or use the traditional ink-and-brush technique in new styles that combine Chinese and Western elements. All of these ink paintings are considered within the classical Chinese painting market, and are being sought by many of the same collectors who buy much older works. Although landscape is the Chinese genre par excellence, the earliest paintings were figural. From the Han Dynasty (206 B.C.–22 A.D.) through the Tang Dynasty (618–906), the human figure was the chief preoccupation of Chinese artists, who depicted people on tomb paintings, in illustrations of court life and battles, and in symbolic representations of Confucian teachings. Portraits and other depictions of the social scene continued to be painted down to modern times, as revealed in an exhibition currently on view at the Minneapolis Institute of Arts, “Infinite World: Chinese Figure Painting of the Ming and Qing Dynasties” (through March 22). In 30 hanging scrolls, handscrolls, and album leaves, the show explores the range and richness of non-landscape Chinese painting. Among the subjects are Taoist magicians in search of immortality, beautiful women (either elite or courtesan), ancestors to be revered through their portraits, and, most interestingly for the history of painting, depictions of art connoisseurs gathering to show off and compare their collections. The Metropolitan Museum of Art in New York also has an exhibition of Chinese paintings up this month, “The Art of the Chinese Album” (through March 29). From the 12th century on, the intimate album format allowed artists to arrange paintings in relation to each other to achieve various effects. The first landscapes in Chinese art were stylized mountains and trees scratched on bronze vessels and mirrors during the Zhou Dynasty, in the 5th–3rd centuries B.C. During the Tang period painters discovered the landscape—although in Chinese terms it should be considered a rediscovery, since the roots of Chinese art and writing alike are believed to lie in nature. But it was during the Song Dynasty (960–1279) that landscape painting really came into its own, with a set of aesthetic canons and sophisticated techniques. “The idea of Chinese landscape painting was set out in the Song and pretty much carries through the rest of Chinese art history,” says Stephen Allee, curator of Chinese painting at the Freer–Sackler Galleries of the Smithsonian Institution in Washington, D.C., which showed Song landscapes last year and is currently exhibiting Yuan Dynasty (1271–1368) landscapes alongside Ming and Qing landscapes in Yuan styles. During the Yuan Dynasty, a plethora of styles were developed, some spare and minimal, some tight and detailed. In its exploration of these styles, the Freer–Sackler show has had to rely in part on later works, from the Ming (1368–1644) and Qing (1644–1912) Dynasties, done in Yuan styles. 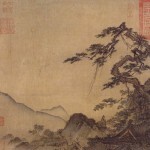 Emulation of past painters—as an homage, a way of learning, or simply as a substitute for an unavailable original—is a consistent phenomenon throughout Chinese painting, and is not seen in China as a sign of creative weakness as it would in the West, although of course some eras were clearly more innovative than others. One of the more intricate paintings in the show is The Wang River Estate, a handscroll in ink and color on silk, now attributed to the Ming artist Song Xu (1525–circa 1606) and formerly attributed to the Yuan artist Wang Meng (circa 1308–1385). 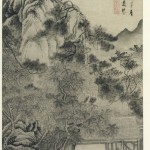 The dotting technique, the fineness of definition of the pine trees, and the way the boulders cluster together are all traits of the emulated Wang Meng, but the choice of subject matter reflects the actual artist, Song Xu, who had a particular interest in patterns of erosion. Another painting in the exhibition, which really is from the Yuan period, is in a different, looser, brushier style. Fisherman, After Jing Hao (circa 1341), by Wu Zhen, merges sea and mountains in an ethereal way. A fan-shaped ink on paper painting in Christie’s Fine Chinese Paintings sale on March 17, from the Qing period, depicts the landscape in a human context, showing a scholar-gentleman sitting amid a copse of trees, looking toward a distant town. He is seen from the back, so the viewer can imagine him or herself in his position. The poem inscribed on the fan describes the pleasures of meditating on nature. 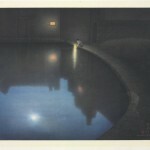 The painter, Ruan Yuan, was a government official as well as an artist. A Ming Dynasty treatise describes the accouterments for the appreciation and collection of paintings: “Rollers of tortoise shell, of red polished gold, of glass, of white jade…Embroidered ribbons. A secret pavilion for keeping the pictures. Precious labels….Old brocade covers. Seals by emperors and dukes. Rare and richly colored bags. Colophons by famous scholars.” Among the calamities that can occur to paintings: “To fall into the hands of a peasant.” Even today, the traditions of connoisseurship surrounding Chinese painting can be off-putting to potential Western collectors who are not immersed in literati culture, who may not be able to read Chinese, and who are unlikely to have access to a “secret pavilion.” However, as Ellsworth hoped, and thanks to the efforts of like-minded dealers and auctioneers and to increasingly accessible museum exhibitions, it appears that Western collectors are getting more interested in paintings and more willing to acquire them. While Chinese collectors still prize paintings for their provenance and pay attention to the previous owners’ seals on the paintings—an imperial mark imparts the greatest value by far—Western collectors tend to be indifferent to such things and concentrate mainly or exclusively on the aesthetics, sometimes removed from the historical context. One major issue for both kinds of collectors is authenticity, a problem in any collecting field, of course, but a particular concern with classical Chinese painting because of the aforementioned history of emulating or even outright copying of old masters, even to the point of copying signatures. Much of this—though by no means all—was done in a spirit quite different from that of the conventional art faker, but no matter what the motive, the result has been a considerable muddying of the waters, making many attributions uncertain. The most notorious instance in modern times was that of Zhang Daqian, a prolific and highly skilled artist in his own right who was dubbed “The Picasso of China” and was adept at styles from the third century to modernist abstraction. Zhang, who died in 1983, was a well-regarded scholar of classical Chinese painting who engaged in archaeological research. But he was also a forger who introduced a very large—and still undetermined—number of extremely convincing fakes onto the market. It is now generally acknowledged that Zhang’s productions can be found in many major Western museums, masquerading as the works of old masters. 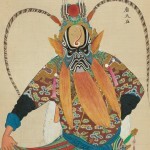 Elizabeth Hammer, senior specialist in Chinese Classical and Modern paintings at Christie’s New York, acknowledges that “authenticity is a cause for concern, as is disagreement among specialists.” One remedy, she says, is to pursue 20th-century Chinese paintings, because with them it is possible to “circumvent the authenticity issue.” With relatively recent pictures, it is often possible to establish a clear chain of provenance, often through descent in a family. In addition, says Hammer, late-Qing and 20th-century paintings have the advantages of plentiful supply and good condition, “plus they are closer to modern sensibilities and aesthetics” while still remaining within the classical tradition. Robert Ellsworth was a keen collector of 20th-century Chinese paintings. Among the lots in the Ellsworth sale will be Prunus Branch and Rock, by Shi Lu (1919–82), a scroll painting in ink and color on silk, dated 1971.